The following occurred in the fall of 1962 (maybe 1961, I am no longer certain). 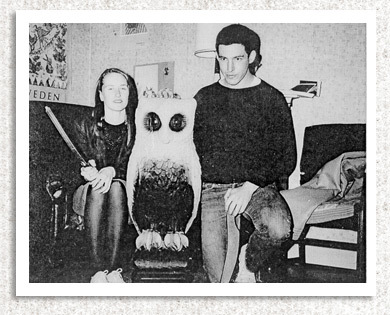 The Doyle Owl was then in the possession of the Haberfeld twins, Steven ’63 and Peter ’63. Along with Bill Pryor ’63, Tom Link ’63, and Michael Dennis ’63—all members of the football team (as was I)—they would show the owl, often in the commons during the dinner meal. A mad rush to take it away from them would ensue but to no avail; they were the biggest and baddest guys on the campus and in good humor they would repel all attempts to wrest the owl away. At the time I was into food fights, for which I had been temporarily banned from the commons dining hall by the lady-in-charge. Nevertheless, one beautiful fall evening, the owl again appeared while I enjoyed a forbidden meal and watched the chaos as the Reedies again failed to take the owl away from the Haberfelds, et al . . . Later I walked to my off-campus apartment. This took me past the library where I happened to notice that the Haberfeld’s car was parked in the library parking lot, a poorly lit, tree-lined area adjacent to the library. The Haberfelds were very good students and their playful showings of the Doyle Owl did not interfere with their studies. Could the owl be in the trunk of the car? In those days, cars had “wing-windows” next to the windshield, and no alarms, and I easily jimmied a wing-window open. With my long arm I opened the locked car door. I got into the back seat and removed the back cushion. Indeed, as I had heard, there was a simple hole into the trunk through which I could crawl. In the trunk was the Doyle Owl! I crawled out and soon found Dwight Read ’64 nearby (I think in the biology or chemistry building). He had tools in his motorcycle saddlebags. With pliers I was able to crawl back into the trunk and release the trunk lock. Dwight loaded the owl onto his motorcycle (or did he get a pick-up truck?) and it was gone. I reconnected the trunk lock from inside, left a half eaten apple in the trunk, replaced the back seat cushion, closed the wing window and left the car completely locked as it had been when I found it. Dwight and I took the owl to a safe place. The attached photo shows me with Neva Talley Lockett ’65 and the owl. One moonlit night we dug a deep hole, nearly 12 feet deep, close by the old swimming pool. A lot of our friends came and we had a little ceremony and interred the owl. A dead cat was found nearby and placed with the owl, as were Mary Scherbatskoy’s (’63) undies, and sundry other items. A spy was among us, however, because by the next morning everything had been unearthed and the owl was gone. I think I had possession of the owl for about half a year. The actual events surrounding its capture have remained mostly secret until now. Only a few years later, the owl was suspended from a helicopter cable that snapped and it fell, smashing into many small pieces. When Ron Fox isn’t recounting owlish shenanigans, he is Regents Professor of Physics and chair at the Georgia Institute of Technology.